Pasasana (Sanskrit: पाशासन; IAST: pāśāsana) or Noose Pose is an asana. The name comes from the Sanskrit words pasa (or pasha) (पाश, pāśa) meaning “noose” or “snare” and asana (आसन) meaning “posture” or “seat”. back, while twisting to one side. Begin the exercise by standing in the Tadasana (The Mountain Pose). Bend your knees in such a way that you are squatting completely and the buttocks are close to your heels and your torso against your thighs. If you find it difficult to squat placing the feet flat on the ground, you could place a blanket that is folded or a sandbag below your heels. Twist your body from the belly, towards the right side. Extend your left arm, bringing its upper part to the outer side of the right knee. Turn your palm down, bend your elbow and wrap your forearm around your right shin. Extend your right arm, before sweeping it around and towards the back. Grab your left wrist in your right hand. In case you find it difficult to execute this step, you could use a strap to close the gap. Alternately, you could just hook your fingers. 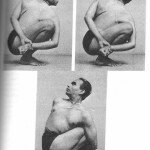 Deepen the pose by using the arm that is placed against the knee to twist further, towards the right. Turn your head towards the right too, to make it easier. At the same time, pull your shoulder blades down the back and towards each other. Make sure that your outer hips are firm and press your heels into the floor, thereby lowering your sitting bones towards them. Release the twist after around 5 breaths or so. Repeat the exercise with the other side of your body. Do not practice this pose, if you have a lower back injury, or if you experience pain in the back due to any reason. Those who have a herniated disc should not try to execute any yoga twists, like the Noose Pose. The Noose Pose is one of the more advanced yoga poses, as you need to squat, balance your body and turn it in a twist at the same time. Not many people can execute this pose perfectly the first few times they try it. If you are trying the Noose Pose for the first time, it may be advisable for you to try a simpler version of the sequence, where you stand close to the wall, so that it is possible for you to use it as a prop. Several beginners also go through the rudiments of the Noose Pose, while they sit in a chair. 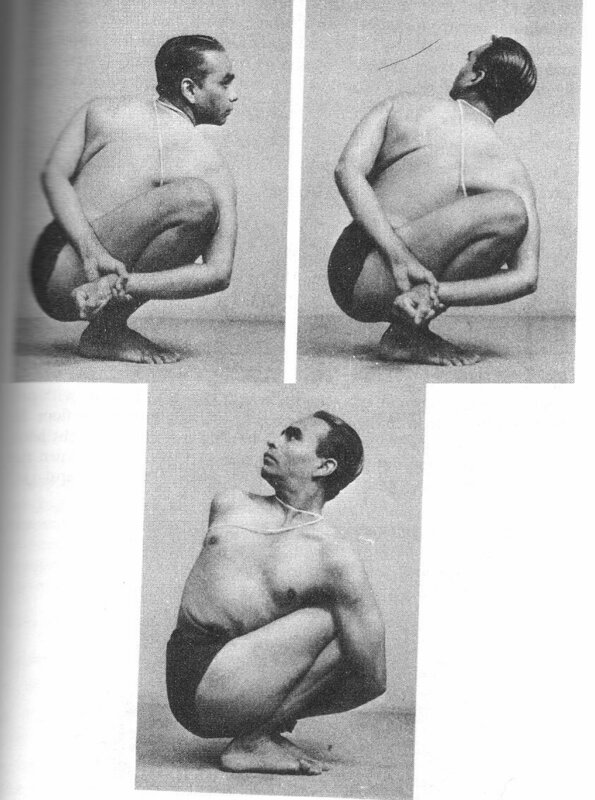 To practice this pose using the chair for the first time or so, sit near the front edge of your seat. Press your left hand on to the outside of your right knee and then twist your body to the right. To improve the twist, you could push your right hand against the back of the chair and lift your spine. Breathe in and out slowly, a few times and maintain the position. Lean forward slightly, pressing your left forearm to your knee. Hold the position for a few breaths and then try to lay the left side of your torso down, close to the top of your thighs. Make sure that your palms are pressed evenly and firmly against each other. Slowly, untwist your body and get up, while you breathe out. Repeat the entire exercise, with the other side of your body. Once you feel comfortable practicing this sequence, you could try the simpler Noose Pose, using the wall. Swing your knees a bit towards the left side. Breathe out and turn your torso towards the right. Use the wall for support, by pressing both your hands into it. While you press your left hand into the wall, the elbow should press against the outer part of your right knee. Snug your knee into the armpit and bend your elbow, before swinging the forearm around the front of the shins. 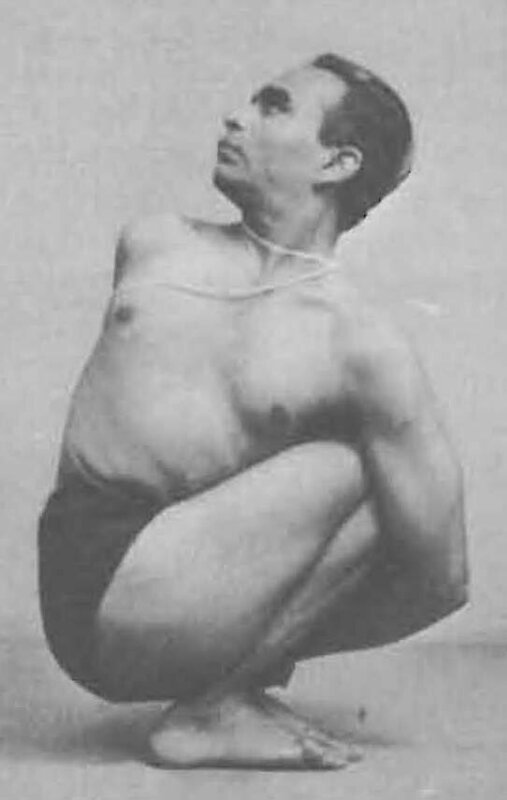 The Noose Pose is usually a part of a long seated twist sequence. However, it could also help as warm up when doing twists such as Ardha Matsyendrasana or the Half Lord Of The Fishes Pose and Marichyasana III or the The Sage Pose III.